There are certain biblical images that are ingrained in our heads just from cultural osmosis. Even at this late date, the Good Shepherd is one of those images in the larger culture. I feel okay saying that because even Hollywood called a CIA movie staring Matt Damon The Good Shepherd recently. The movie didn’t do so hot and I can’t recommend it, but they expected the Biblical allusion to have enough currency to use the name. But what I am always amazed at when the lectionary throws up one of these common images (one portion of John 10 with shepherd images is always on Easter 4) is that the common gloss on the text is at best half the story. In the case of the Good Shepherd we jump straight to Calvary. In theologically squishy places the Good Shepherd is the perfect image to pitch Jesus the great teacher or a Unitarian all loving spirit. But the text itself is intensely Trinitarian as it is about the relationship between the Father and the Son. The Son is the Good Shepherd and not the hired man because he shares the love of the father for these sinful oblivious sheep. But the metaphor goes beyond that gospel image. Love is defined as aligning yourself with the Father’s commands. Love is defined as putting yourself between the sheep and the wolves. It is defined contrary to the hired man who does what it natural. When you see the good shepherd, when you comprehend in a meaningful way the gospel, at that point you are no longer a sheep. 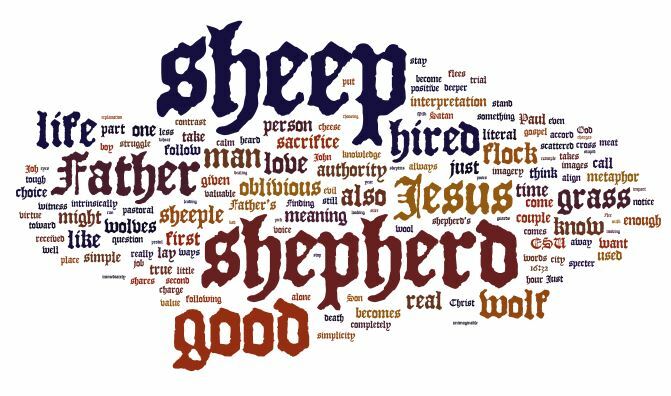 You have a choice – hired man or good shepherd. It is the first real choice in your life, and it is also one that the sheep are oblivious to. Don’t expect applause. Except from Father and Son. This sermon attempts to proclaim that love of the Good Shepherd and give it some form of what it really looks like in the Christian life.